This is, without a doubt, one of our favourite Rival Gaming slots here at VegasMaster. The winnings are unstoppable and, the bonus round featuring a dual between fighter pilots is real fun. However, nothing beats the free spin feature. You just gotta try this! Don’t bother reading the review…you are losing valuable playing time! 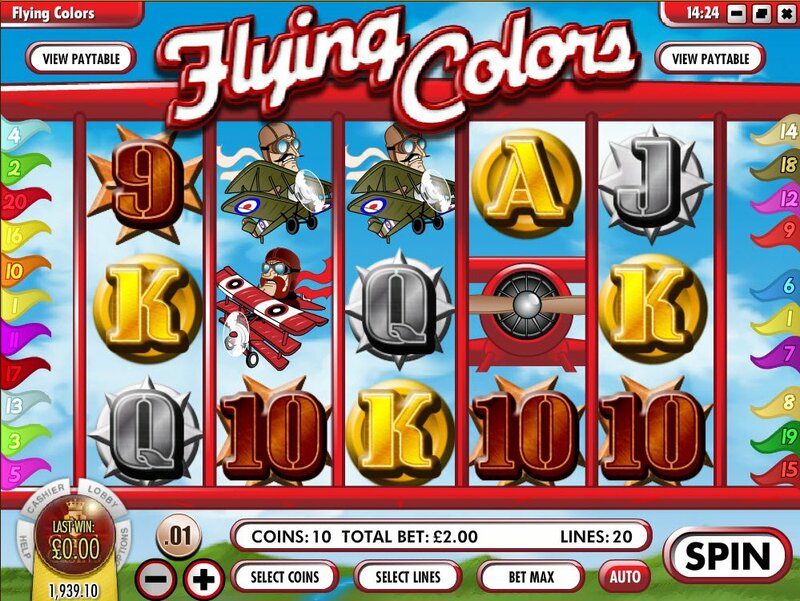 We are introduced to the Flying Colors video slot with delightful cheery and uplifting music. We have a burnished brown 9 and 10 symbol, silver Jacks and Queens and golden Kings and Aces to set us off, all worth between 50 and 200 coins. Our green pilot is worth 500 coins, whereas our yellow planed pilot is only worth 300. It is when we start looking at the sexily spread pilot's darling, complete with flower in her hair, that the big money starts flying in - 1,000 for 5 of her posed elegance on your reels. 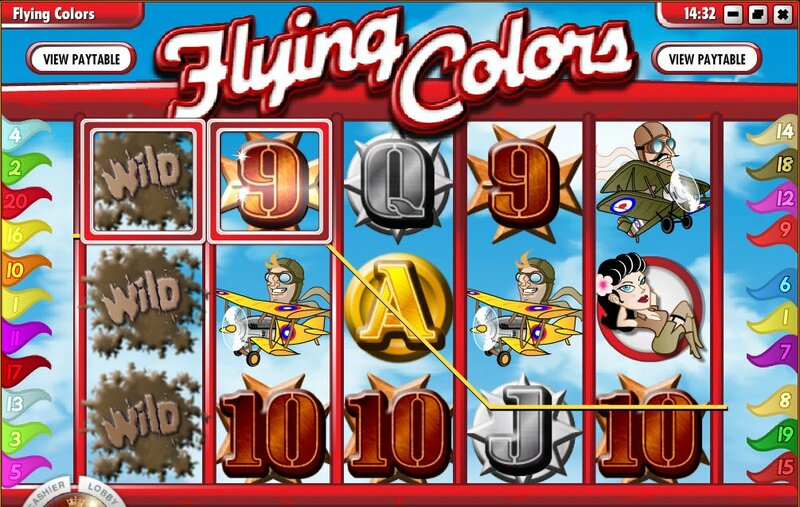 Almost right off the bat, at only my third spin of the Flying Color slot reels, I was awarded with free spins. My first reel, splattered with mud with the word "Wild" on it was my guarantee that I would come out of this flight course profitably. Indeed, I won £88.20. One of the best beginnings to a Rival Gaming video slot I have ever had and, these first moments of joy meant I put a shortcut to this Flying Colors slot right on my desktop, so there would be no chance of steering off course in the future! On my very next spin, I ended up winning some Flying Color slot free spins yet again! Almost not believing my luck, I nervously pressed "Go" on my 6 free spins and, won an additional £88.80. Almost right off the bat, at only my third spin of the Flying Color slot reels, I was awarded with free spins. Our wild symbol looks like either an engine of a plane, or a bomb from a fighter jet. Either way, this is lifting my spirits higher, bng worth 10,000 coins and all! The Crimson Kaiser plane will trigger the bonus round which I assumed could not be as exciting as the Flying Colors slot can't lose free spins that kept flying into my vision field. 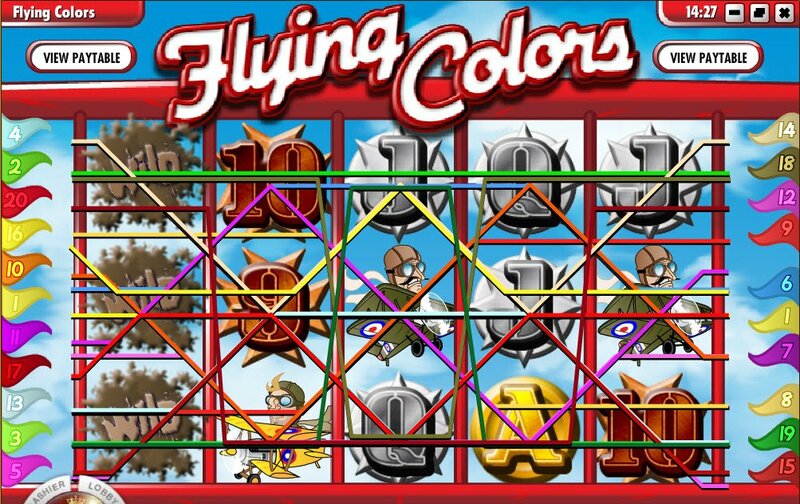 However, the Flying Colors Slot bonus round featured shooting down an enemy fighter jet and, the fun really began avoiding him shooting our bonus plane coin drain down!